Right before I left our home in Missouri I was able to enjoy two Canada geese with their goslings by the pond. Watching them was a goodbye present. Back in the Netherlands, I look up from my desk across the pond…and I can’t believe my eyes: in the grass, covered mostly by the Rhododendrons, a mother duck is lying down with her ten squirmy fluffballs. What a treat. Right away I know what I want to paint. Mother duck has been brooding here quietly for the past four weeks, and I return just in time. Her partner is nowhere to be found. Things work a little differently for ducks than geese. 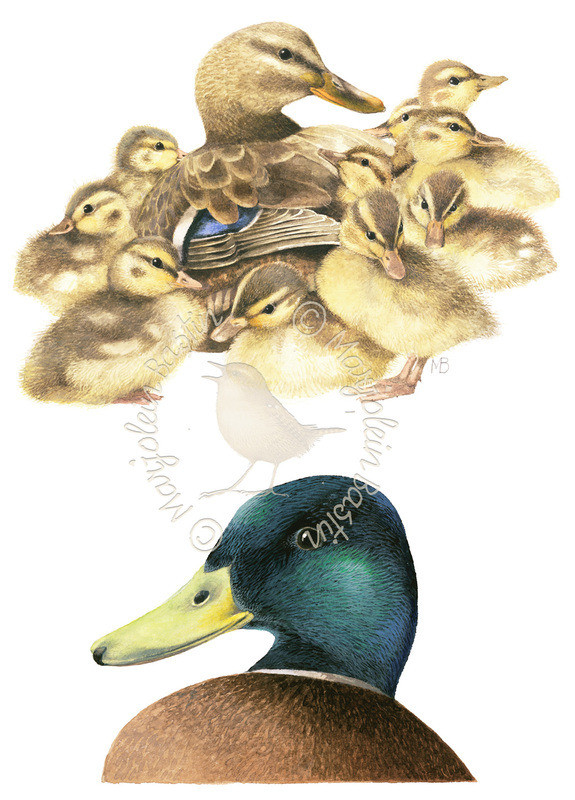 The mother duck is careful, the quiet pond in the woods isn’t quite as safe as it may seem at first. While we don’t have predatory fish here, we do have herons, foxes, European pine marten, European polecat, weasel, crows, birds of prey…brrrr! Every day I count the little ones swimming behind their mother. Seeds of the Marsh marigold are removed, grasses stripped, mosquitoes snatched out of the air. The ducklings are perfectly capable of feeding themselves right away. Mother stays around for four weeks to keep them warm and safe. At that time the ducklings can fly and they have learned what to look out for from their mother. And who knows, maybe very soon this new mother will be tempted once more by this dapper drake, with his shimmering green head and small curl in his tail feather. Then, as soon as she starts brooding again she will chase him off. She can handle the rest by herself just fine.